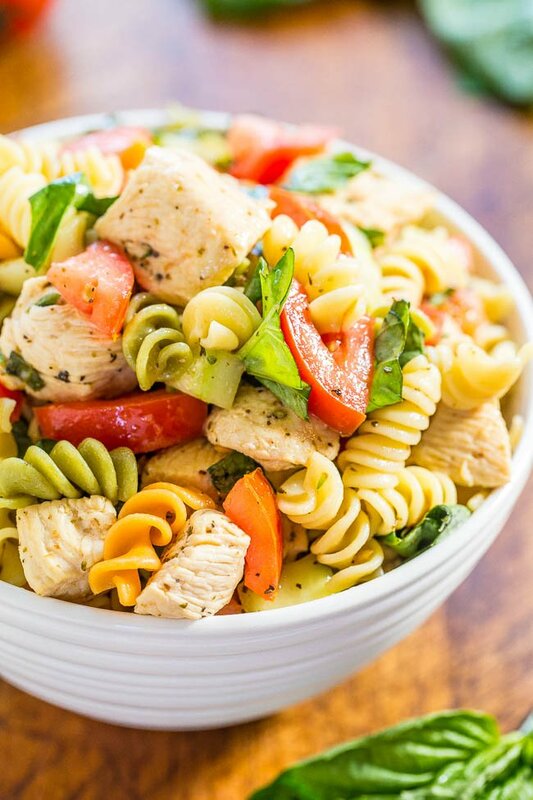 This Italian Chicken Pasta Salad is easy, ready in 20 minutes, and showcases some of my favorite summer ingredients. It’s perfect for summer potlucks and BBQs, or as a no-fuss family dinner! I eat tomatoes, cucumbers, and basil year-round. Love them. That’s my go-to trifecta for salads, but everything just tastes so much better in the summer. There’s flavor and texture galore in every bite of this dish. Tender chicken, al dente pasta, juicy tomatoes, crunchy cucumbers, the peppery bite of basil, salty parmesan cheese, all perfumed with lemon juice, lemon zest, and Italian seasoning. It’s healthy, perfect for busy nights, and makes a big enough batch that you can have some planned leftovers for work or school lunches. You can serve it warm or chilled, and since there’s no mayo it’s great for potlucks, picnics, and parties. To make this rotini pasta salad, you’ll first need to cook the pasta until al dente. While the pasta is cooking, whisk together the pasta salad sauce ingredients (olive oil, lemon juice, apple cider vinegar, honey, Italian seasoning, lemon zest, salt and pepper). Set the dressing to the side. Cook the chicken in a skillet, seasoning simply with salt and pepper. When the chicken is almost done, pour in the sauce you just made and let it bubble away until slightly thickened. Make sure to flip the chicken throughout this process! Once the chicken is fully cooked, dice it into small cubes and add it to a large mixing bowl, along with any drippings left in the skillet. Add the tomatoes, cucumber, basil, pasta, and Parmesan to the bowl and toss to combine. Give the tri color pasta salad a taste to see if it needs any additional seasoning (salt, pepper, Italian seasoning, etc). What’s the Best Pasta for Pasta Salad? I love a classic rotini pasta salad, but any sturdy pasta will work! 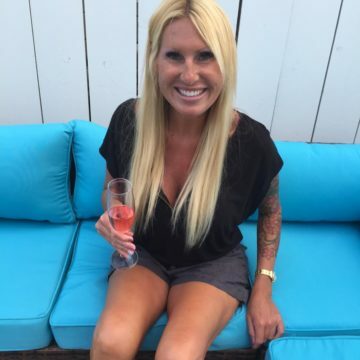 I’d steer clear of spaghetti and long pastas like that. 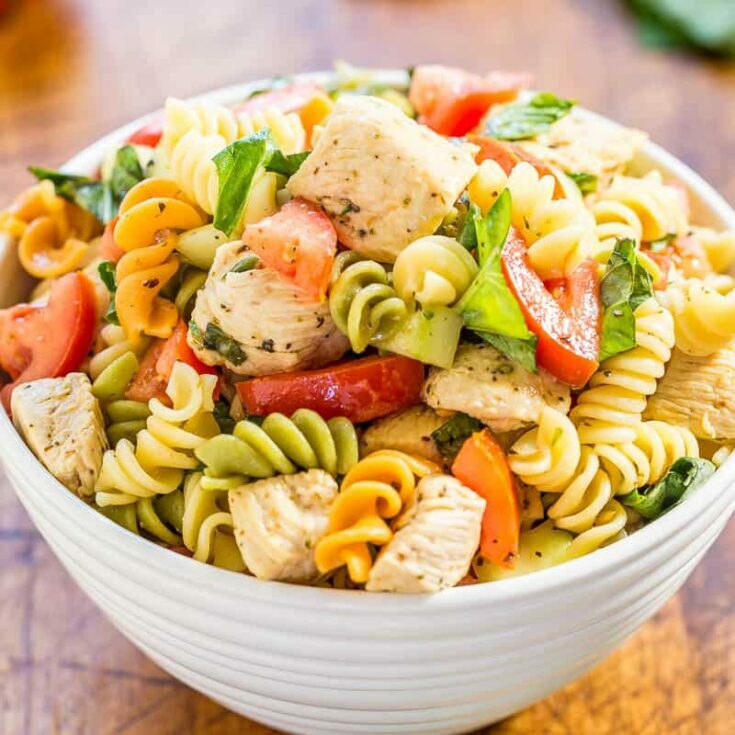 Rotini, bow tie, and macaroni are all good choices for this Italian chicken pasta salad recipe. This Italian chicken pasta salad keeps in the fridge for up to five days if stored in an air-tight container. This can be enjoyed as a cold pasta salad straight from the fridge, or you can warm it up just before serving the leftovers. You may need to toss the homemade pasta salad leftovers to redistribute the juices, too. It’s important that you don’t cook the rotini past al dente. The pasta will soak up the dressing as it sits in the fridge, and if you over cook it you run the risk of making soggy pasta salad! Also, fresh basil is key to this recipe. You can’t substitute dried herbs in this recipe — the fresh basil really makes the flavors pop! If you’d like to make this Italian pasta salad vegetarian, you can use chickpeas instead of chicken. To be honest, I haven’t tried this myself. But I imagine this pasta salad would still turn out delicious that way! BLT Pasta Salad — This 15-minute pasta salad feeds a crowd and is loaded with bacon, lettuce, and tomatoes! Taco Pasta Salad — Perfect for picnics and parties, this taco salad is made with corn, black beans, cilantro, avocado, and more. Garden Fresh Tortellini Pasta Salad — Cheesy tortellini is paired with tomatoes, cucumbers, and basil in this simple recipe! 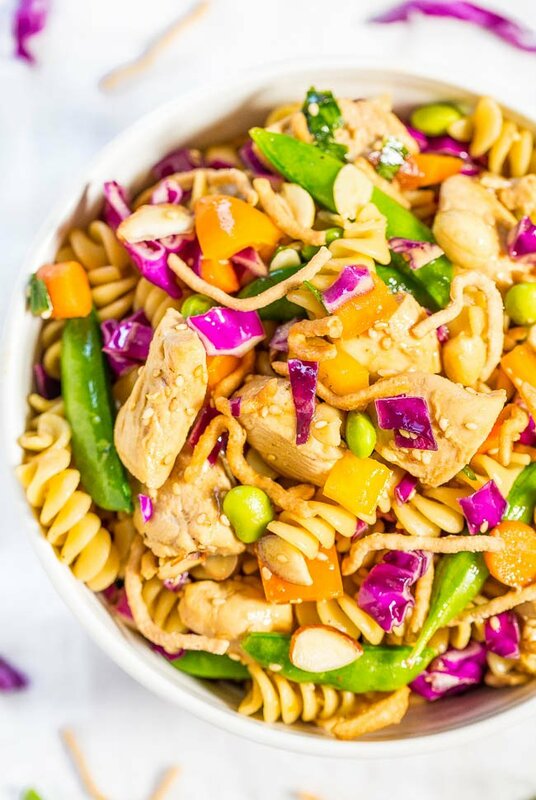 This Italian Chicken Pasta Salad is easy, ready in 20 minutes, and showcases some of my favorite summer ingredients. It's perfect for summer potlucks and BBQs, or as a no-fuss family dinner! Cook pasta according to package directions, drain, place in a large bowl, and set aside. To a medium bowl or large measuring cup, add 2 tablespoons olive oil, lemon juice (zest the lemon before juicing it), apple cider vinegar, honey, Italian seasoning, lemon lest, salt, pepper, and whisk to combine; set sauce aside. Add the sauce and allow it to bubble at a medium-fast boil for about 3 to 4 minutes, or until sauce has reduced some and chicken is cooked through. Stir sauce and flip chicken intermittently throughout. Add chicken and any cooking liquid to the pasta bowl. Add the tomatoes, basil, cucumber, cheese, and toss gently to combine. Taste and check for seasoning balance, making any necessary adjustments (more Italian seasoning, salt, pepper, pinch of cayenne, splash of lemon juice, etc.) before serving. Will keep airtight in the fridge for up to 5 days. Serve cold or reheat gently prior to serving if desired. *Cherry or grape tomatoes, sliced in half, or your favorite tomatoes may be substituted. 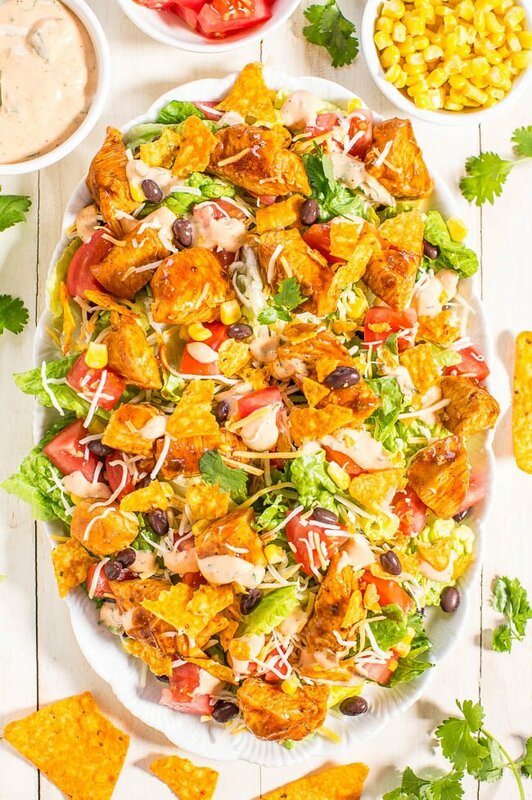 Loaded Chicken Taco Salad with Creamy Lime-Cilantro Dressing – Fast, easy, fresh and healthy!! All your favorite taco flavors in one big kickin’ salad that everyone will love! 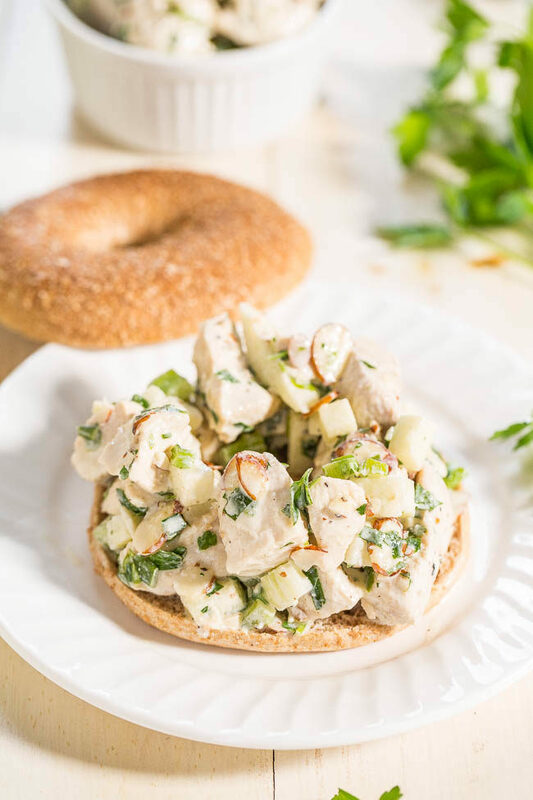 Lighter Chicken Salad – Hello to easy, flavorful, healthier chicken salad! Goodbye mayo, hidden fat, and empty calories! You’ll never miss them in this fresh twist on the classic! We can always eat a good pasta salad around here–they’re good warm the first time around and even more flavorful eaten cold the next! I like the Italian twist on this one and it will be a great use for my basil. Totally agree that salads like this get even more flavorful the next day when eaten cold! I have a ton of basil on hand right now too! This was the perfect lunch–full of garden goodies and filling without being heavy. The flavor is bold too ( love the lemon and parmesan together)! I’m keeping up on pruning my basil regularly so it is really keeping me well supplied– I’m glad this recipe called for a generous amount. This recipe kind of came about because I had SO much basil and accidentally over-bought tomatoes every time I went to the store for a few weeks :) Glad you liked it and love the bold flavors! Pasta salad is the best for those busy nights when you need some super easy peasy and delicious! I’m loving the Italian flavah, with that little cayenne heat! Pinned! Is there anything better than a great pasta salad in the summer? This one looks great! I could eat a whole bowl of pasta salad alone. It’s my favorite! I need to try this sooN! Everytime we go grocery shopping we get cucumbers, tomatoes and basil, I am not even kidding, I don’t care what season it is. we always have these 3 ingredients in our house, so good for quick side dish salads, and the basil is great almost in all main dishes! Love your colorful salad and the chicken addition! I love pasta salad it’s my go to meal idea all summer that and panzanella. I just made southwestern chicken pasta salad last night with chicken, beans, salsa, jalapenos and cilantro…so good…as soon as that’s done this will be next on my rotation. Your southwestern flavors sound awesome! If you try this one after that’s done, LMK how it goes! Sending this one to my mom! You have way more chicken recipes than I’d have guessed! This would disappear! And I’d probably be the one eating it all!! So summery, I love it!! This would make a great no cook supper when we have leftover chicken! I’ve always made my pasta salad with bottled italian dressing, excited to try the seasoning mix instead to see if it makes a difference! I’ve done your method too and this tastes less…greasy or oily to me than when I use storebought Italian dressing. Sometimes that’s gets a bit too thick/oily for me and this is more light and fresh than that. LMK what you think! My daughter has been growing basil this summer with awesome results. She is looking for ways to use it. We need to make this pasta salad! Pinned! That’s great about your daughter’s green thumb! And thanks for pinning! I would have loved it if someone brought this in where I was working before! I”m pretty sure they’d be my new favorite person! 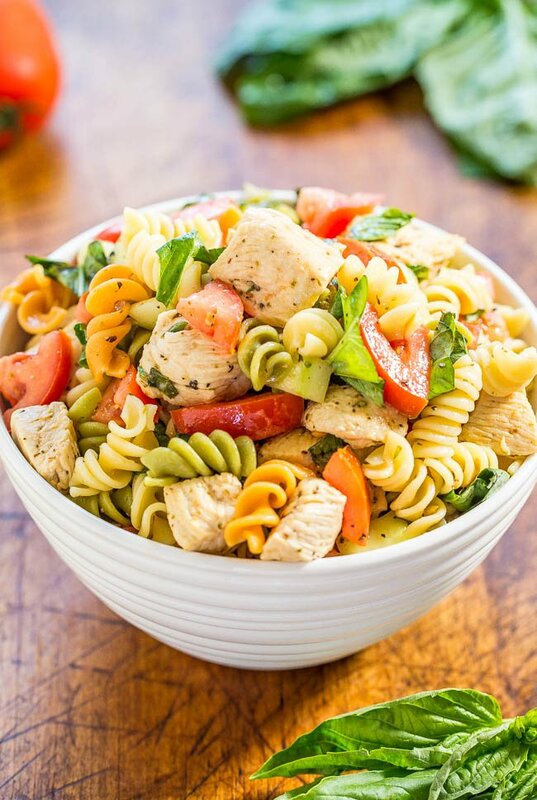 This looks like a great pasta salad! I love being able to bring pasta salads to get togethers, especially when they don’t have mayo. Mayo can just get a little funky after a while. Looks yummy! This looks delicious! Question: when should I add the apple cider vinegar? I don’t see it in the recipe directions. Thanks! Good catch – I had omitted it from the directions but it’s there now in step 2. Enjoy! Simple recipe but looks very tasty! I have eaten this before on a Delectable Destinations culinary tour in Italy. Thanks for the simple and tasty pasta salad. I made it last night. It was so easy to make the marinade and it really was good. Thanks for creating something so easy and good. I asked my girlfriend what she wanted for dinner, and she said she thought a cold dish would be great. So I started my Google search and very quickly came across this recipe. This was amazing! Very simple to make, and extremely flavorful and refreshing. We’ll be having this again!Curious though – the images show the salad with red and orange bell peppers, though the recipe doesn’t call for them. I added them in anyway (because I love peppers) and I feel like they were a very solid addition. Not just to the taste, but to the beautiful look, as well!Lastly – I also cheated a bit. I forgot to thaw some chicken, but we had a package of pre-cooked chicken strips from Costco in the fridge. So I just pulled those out, boiled the sauce first, and then added the chicken once it came to a medium boil. Came out perfectly! So just a little tip for anyone who might either be forgetful like me, or just a bit lazy (also me!)! Thanks for the 5 star review and glad you loved this! I think what you may be seeing is the side/edge of a tomato that’s on the more orange side rather than red making it appear like an orange pepper. This salad is such a flexible recipe that really you can add almost any kind of veggies you want and will be fine. This was really good! Followed the recipe exactly and both myself and my husband were surprised at how refreshing and tasty this was!I did use cherry tomatoes though, they were on sale. Thanks for the 5 star review and glad you both enjoyed the recipe!